What’s on in April for the Gold Coast, Brisbane and Sunshine Coast? We are already heading into the fourth month of 2016. As the weather is well and truly cooling, this won’t stop all the fun to be had. Some of the highlight events include Supanova on the Gold Coast, The Australian Surf Lifesaving Championships on the Sunshine Coast and the traditional ANZAC services across the country. Swimmers from all over Australia will gather for the Gold Coast’s premier ocean swim. The Cooly Classic offers competitors a rare opportunity to conquer three of Australia’s most revered surf breaks – Snapper Rocks, Coolangatta and Kirra. The events on offer are the Junior swims of 300m and 1km. The Cooly 1000 – 1km swim, Cooly Classic 2.0 – 2km swim, and the new 3.0km Marathon distance. Get ready Gold Coast as Australia’s biggest Pop Culture Expo – Supanova arrives at the Gold Coast Convention and Exhibition Centre April 8th -10th. Throughout these dates, Broadbeach will be transformed into the ultimate world of fantasy and play with QPOW on Broadbeach featuring special free movies in the park, Teenage Mutant Turtle meet & greets and the Supanova Cosplay Parade in conjunction with the Gold Coast Film Festival and Supanova Pop Culture Expo. Gold Coasts major ANZAC day service is hosted by Currumbin RSL on the breathtaking Currumbin Beach. At 3.30am the Park and Ride free shuttle service commences. At 4.20am the Parade assembles at Murraba Street, Currumbin Beach and march off begins at 4.35am. The Dawn Service commences at 5am at Elephant Rock, Currumbin Beach. Channel 7 Sunrise program will be televising the service from 5am if you are unable to attend. There is also a dawn service in Surfers Paradise at approx. 4.30am and it is on the Esplanade approximately 200 metres from Cavill Mall. Transport from our Broadbeach properties is available on the G: Link (Light rail) from the convention centre and to Cavill mall stop. ULTIQA Air on Broadbeach & ULTIQA Freshwater Point Resort are within driving distance of Currumbin Beach or Light Rail (GLink) to the Surfers Paradise dawn ceremony. Michelle brings a message of positive change and compassion with unique style and infectious enthusiasm to propel people – no matter what their age, gender or income – towards healthier and more active lifestyles. The 2016 South Queensland Caravan, Camping, Boating and Fishing Expo is one of the region’s largest events, showcasing the latest in caravans, camper trailers, motorhomes, boating, vehicles, camping gear and outdoor accessories. With over 140 local and regional exhibitors all in the one place displaying the latest products and services. This massive event all takes place at the Nambour Showgrounds. Chase the sun to join 7,000 Surf Lifesavers representing 311 Surf Clubs competing across three beaches in over 380 events across nine action packed days. The event will be showcasing Youth, Masters and Open competition, The Australian Surf Life Saving Championships is the largest event of its kind in the world. Come and watch all the action and be part of this iconic event which returns to the Sunshine Coast for the first time since 1980! Caloundra RSL will be hosting services for the area. The service will take place at Lions Park, Kings Beach and will start at 5.20am. Assembly is at 5.15 am and there will be a bus service from 4am. The RSL will also host a Gunfire Breakfast at 6.30am. Finally, at 9.00am there will be a veteran’s march from Stockland Carpark and conclude at the Caloundra RSL. ULTIQA Shearwater Resort is located on the Shores of Kings Beach and directly across from the park in which the ceremony will be held. You will be cross the road and be a part of the ceremony or watch from the comfort of your balcony. 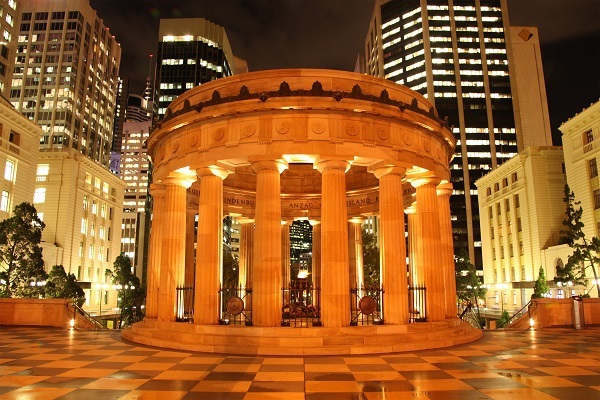 ULTIQA Rothbury Hotel is located only 100 meters from ANZAC Square and will be in the centre of all the Remembrance Services. The Brisbane ANZAC Day Parade commences at 9:30am at the corner of George and Elizabeth Streets. Units follow a route up George Street, right into Adelaide Street and then right again into Creek Street. They will turn left into Creek Street and proceed to ANZAC Square and Central railway station in Ann Street. ULTIQA Rothbury Hotel is located just 100 meters from ANZAC Square and Central station, where you can watch the ceremonies and parade.